As you may have guessed from a blog primarily about food and photos of food, I love eating. I also have a fair few interests that involve sitting on my arse. You can probably imagine this can sometimes lead to me putting on a bit of weight that I don’t necessarily want. I think the problem is finding exercise that I enjoy that can be done mid week after work. I really like getting out into the country and going for a walk, but that happens far less frequently that I would like. I’m also not very competitive, which is a bit of a hindrance when combined with an innate laziness. I’d been after something to encourage me to do more exercise for a while, preferably something that could help me forget the fact that I was actually doing exercise. I’d heard of Zombies, Run! before but thought I wasn’t quite fit enough to use it yet since I’d never really tried running much. Luckily they’d been kind enough to release a 5K training version of it. This is a way of building up your ability to run, but starting slowly. You walk for a minute and run for fifteen seconds, changing the ratio of the two until you should be able to run 5K after a certain number of weeks / months. All the while you are listening to a story about zombies that helps explain why you’re running around like a lunatic, and listening to your own music. This sounded perfect for me. 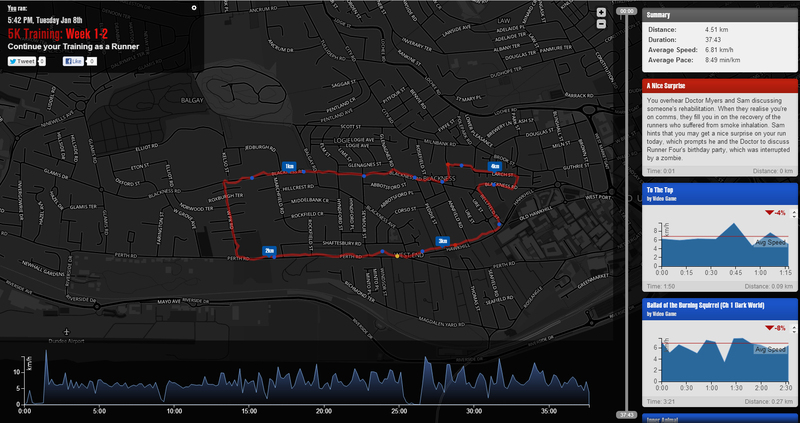 A geeky story and a simplistic computer game tied in with running – It even displayed your route with statistics and the map looked like it was from a zombie video game. What could go wrong? I could fall down at the end of my third run in a horribly embarrassing and equally painful manner. That’s what could go wrong. During my run from the zombies a simple pot hole in the pavement caused me to go flying and sprain my lovely, lovely ankle. Thankfully I had made it past the large gym window full of genuinely fit people on their pothole free treadmills. I picked myself up and shambled home in a manner not dissimilar to that of the imaginary zombies that I had been fleeing from just moments before. My ankle is still pretty sore so I’m gonna start swimming again for the next few weeks whilst my ankle heals. Fingers crossed I’ll not drown. When I’m all healed though I’m definitely going to try this again as I did find it surprisingly fun. It’s a nice simple way to get started (you mainly walk during the first few sessions, hence my super-slow pace in the screenshot above) but this stops you overdoing and completely tiring yourself out, and having a zombie story is a good way to keep your mind off the running. One final thing that I have learned over the past week, is that I very much doubt I would survive a zombie apocalypse. I am hoping that this one, terrifying thought will be enough to get me fit.